Awards & Honors — TSi GEOTECHNICAL, INC.
Utilizing our nearly 30 years of experience, we provide extensive geotechnical expertise and technical skills to effectively manage geotechnical risk for our clients’ projects. But that is not all our team does. Our employees work hard to make a difference in the lives of our clients, their communities and around the world. We are honored when organizations recognize us for our innovation, business practices and people. We look forward to continuing to build on this list as we develop new ways to make our clients and employees more delighted than ever. 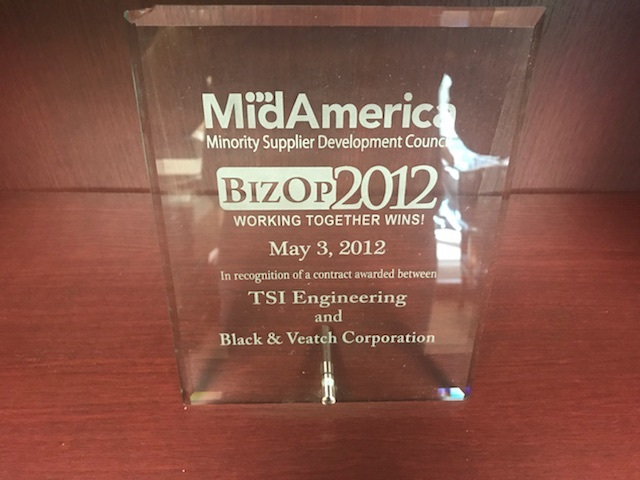 Named as Professional Services Firm of the Year, The St. Louis Minority Business Council recognized TSi as a leading Business Enterprise across the St. Louis area. TSi was recognized for overall business achievement and continued commitment to diversity within the community. A forum for corporate executives, diverse supplier principals, procurement and supplier diversity staff, and heads of community organizations, TSi was recognized as a high performance supplier for our residence and work in the Kansas City Community. This annual award is presented to a Minority/Woman-Owned Professional Services firm demonstrating exemplary performance. The MS Corporate Achievers award honors corporate executives for their career achievements and community contributions. As an MS Corporate Achiever, TSi raised a minimum of $2,017 for research and services for people with MS. Awarded in recognition as a valued member of the St. Louis Vendor Community for our ongoing efforts to exemplify excellence in customer service. Awarded for our dedication to strengthen the business environment as a member firm through government advocacy, political action, and business education. Awarded for our partnership and employment opportunities, CCDI is a collaborative that works to expose minority and disadvantaged students to the many career opportunities in construction. Awarded by MoDOT as a corporate sponsor for their annual remembrance walk, typically in conjunction with National Work Zone Awareness Week. Recognized as a sponsor during the Annual KCGCP Awards Recognition Ceremony that honors contractors and small businesses that have demonstrated a commitment to minority business development in the metropolitan area. Recognized as a member company of the association to aid in the promotion a of strong and growing commercial and industrial building industry. Serving both Kansas City and St. Louis Missouri. SAME annually presents medals and awards to individuals and organizations from the public and private sectors in recognition of achievement in support of the A/E/C profession, national security objectives, and the SAME Strategic Plan. Awarded in recognition of the teaming partnership formed between TSi Geotechnical Engineering Inc. and Black & Veatch Corporation. Recognized as a bronze sponsor during the Annual KCGCP Awards Recognition Ceremony that honors contractors and small businesses that have demonstrated a commitment to minority business development in the metropolitan area. Recognized as an outstanding MBE Contractor during the Annual KCGCP Awards Recognition Ceremony that honors contractors and small businesses that have demonstrated a commitment to minority business development in the metropolitan area. Awarded during the 25th Annual MidAmerica Minority Business Development Council Award Luncheon in recognition of both our financial and professional contributions to the completion of the new Kansas City Chiefs stadium. Awarded in recognition of the teaming partnership between TSi Geotechnical Engineering, Inc. and Burns & McDonnell. Awarded in recognition of the teaming partnership between TSi Geotechnical, Inc. and JE Dunn Construction.